Taken from Berroco Booklet #313 Comfort & Vintage: "A richly colored, seamless pullover features a whimsical embroidered yoke and sleeve trimming." Size US 6 and US 8 - 40" circular needles (or size needed to obtain gauge), stitch markers, and a stitch holder are required but not included. Finished Bust Measurements: 32(36, 40, 44, 48, 52)" after blocking. Gauge: 20 sts and 27 rows over 4"
Colors show are #5192 Chana Dal (MC), #5156 Cork (A), #5182 Black Current (B), #5176 Pumpkin (C), #5154 Crimson (D), #5157 Paprika (E). Cubics Fixed Circular Needles - US 6 (4.0mm) - 40"
Cubics Fixed Circular Needles - US 8 (5.0mm) - 40"
$110.50 -- Kit price including yarn only (no book or pattern). 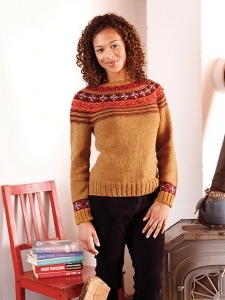 $119.00 -- Kit price including yarn only (no book or pattern).